A new paper in the Bulletin of the Seismological Society of America offers an updated look at the state of the Bay Area's most dangerous earthquake faults. Many news outlets this week went the alarmist route, calling the faults "overdue" to produce damaging quakes. I've pointed out why scientists take pains never to use that "O-word." They can do little more than specify the odds of a particular fault having its next large earthquake. We have no way of saying when that quake will happen. There are a couple of things that everyone should know about the San Andreas fault system. First, it's a whole set of earthquake faults that are organized in three main branches. One is the familiar San Andreas fault, which runs past San Francisco up the Pacific coast. The second splits off the San Andreas down around Gilroy and has various names along its crooked course north past the East Bay: Calaveras, Hayward, Rodgers Creek, Maacama, and so on. The third branch splits off the Calaveras fault in Fremont and runs north still further inland under the names Northern Calaveras, Concord, Green Valley, and Bartlett Springs. Second, the San Andreas fault system does its thing in its own time, at its own speed. 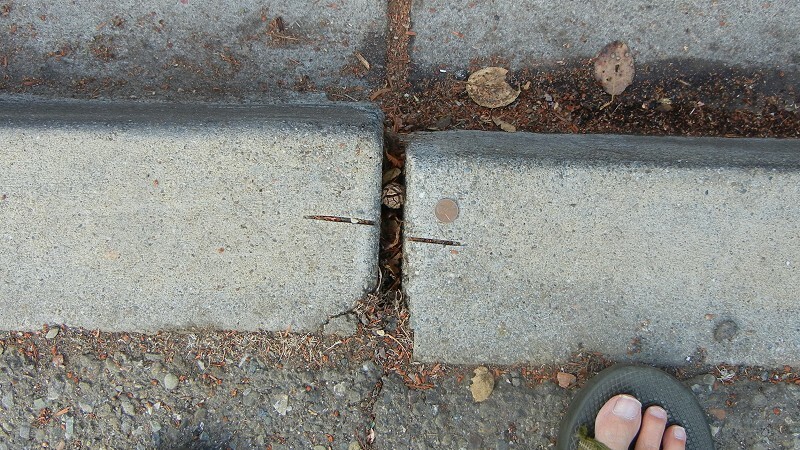 The great tectonic plates that drive these faults move past each other at about two inches a year, roughly the speed your fingernails grow. When a new paper comes out, it's not reporting any change in the fault system itself. It's documenting progress in our own understanding, giving us a picture of something a little more in focus than we could see before. In this week's paper, Jim Lienkaemper of the U.S. Geological Survey and three coauthors summarize a huge number of measurements of fault creep up and down the state. Fault creep is a steady motion that takes place without earthquakes. Scientists have been making these painstaking measurements for decades at dozens of places, as shown in this map from the paper showing the major strands of the San Andreas fault system. Creep varies a great deal in the San Andreas fault system. The authors used this creep data to estimate how much of the fault is creeping (not gaining strain energy) and how much is locked together, gathering energy for the next big earthquake. The main strand of the San Andreas fault is almost entirely locked, but the other branches creep at different rates in different places. One of the authors' big achievements is this graph. 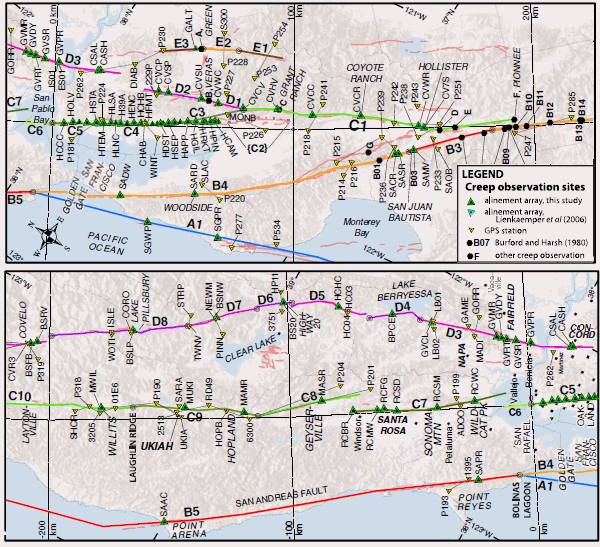 Creep observations along the two eastern branches of the San Andreas fault system. From Figure 3 of Lienkaemper et al. 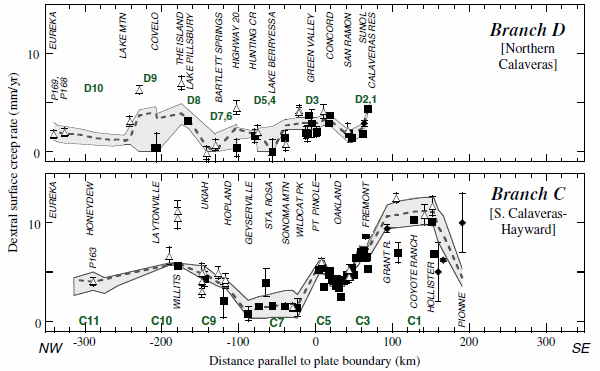 The authors used this data to assess how much energy has been accumulating on the locked portions of each of 21 specific segments of these faults. Combined with the history of earthquakes on these segmentssomething these scientists have been studying with trenching studies for more than 30 yearsthey concluded that several fault segments have accumulated enough energy to be released in major earthquakes. They are the Rodgers Creek fault (segment C7), northern Calaveras fault (D1 and D2), southern Green Valley fault (D3), and the southern Hayward fault (C3 and C4). They appear to have reached the level of strain energy (seismic moment) that's released in earthquakes of magnitude 6.8 to 7.1, around 10 times as strong as the recent magnitude-6 South Napa quake. These are not predictions of any sort, just statements about the energy buildup according to a cutting-edge analysis, involving many assumptions, of an imperfectly known geological system. There's no "overdue" involved, only the suggestion that large quakes are a distinct possibility on these fault segments given their history and behavior. When those quakes may happen is still a roll of the dice. Nothing has changed except what we know.